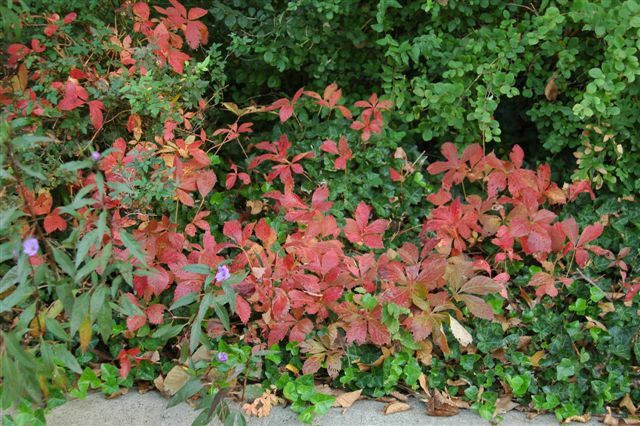 Virginia Creeper ​also makes an effective groundcover for larger areas. HABIT: Vigorous climbing vine. 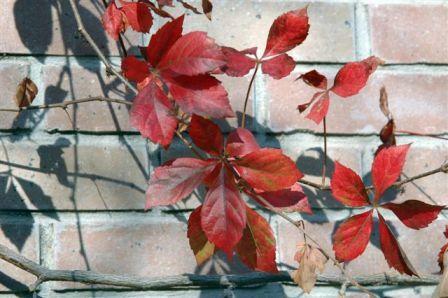 Looser growth and larger leaves than Boston ivy. Red foliage in fall. Climbs to great heights. CULTURE: Needs pruning to keep under control. Any soil in sun or shade. Responds well to well-prepared beds and moderate water and fertilizer. Above shot shows Virginia creeper on the left and poison ivy on the right. Small leaves in the center are new growth on the Virginia creeper. USES: Interesting texture and good fall color. Good for arbor, fence, or large building. Makes an effective natural-looking groundcover. NOTES: Often confused with poison ivy. This plant has five leaflets instead of poison ivy's three. Native to Texas and eastern USA. Good for fall color.